The popularity of tiny houses has been increasing since the launch of the Tiny House Movement in 2008 in the United States. In Canada, the movement has been gaining popularity over the past five years. As for Quebec, the Mouvement Québécois des Minimaisons (Quebec Tiny House movement) was launched in January 2018. The festival of tiny houses, which has been held every year since 2015, is also in conjunction with the fair Ecosphère of Montréal from August 11 to 12, 2018. Come and visit us! Today about 1% of houses purchased in the United States are tiny houses. Tiny house district projects are gradually emerging and more Quebecers decide to take the plunge every month. But the question is: why buy a tiny house? Here are seven reasons to be convinced! But first of all, what is a tiny house? The concept of tiny houses represents houses between 300 and 600 square feet. Houses below 300 square feet are rather called micro-houses. 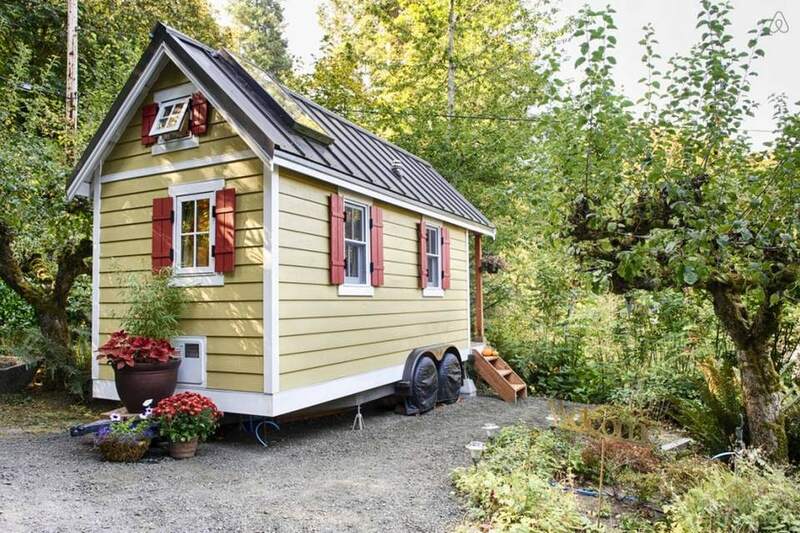 Tiny houses can be built on foundation or on wheels. Since their surface area is about one-tenth that of a traditional house, they are built to maximize the use of space. Often, furniture is multifunctional. For example, stairs, floor, armchairs or bed can be used as storage as well. A tiny house costs between 50,000 and 90,000 CAD, depending on the choice of materials, facilities and appliances. The tiny house is therefore the number one choice to reduce debt as much as possible. In Quebec, the average price of a conventional accommodation (house or apartment) is $265,000. Tiny house equals low energy requirements. Indeed, a small space requires much less heating, air conditioning or lighting. They are also built to minimize these needs, for example by choosing insulating materials. The energy bill of a tiny house represents on average 65% of the bill of a traditional house. In addition to decrease in energy consumption, the small size of tiny houses also significantly reduces the amount of materials needed for construction. The energy footprint of the tiny houses is on average 10 times lower than that of a traditional house. In addition, these houses are usually built with materials that respect the environment and the occupants. The outside and inside architecture of tiny houses are studied in depth to maximize the small space and thus favor the comfort of the occupants. Moreover, as they are designed with healthy and natural materials, living in a tiny house is pleasant! With more and more people leaving the countryside each year to settle near cities, tiny houses would be a solution to avoid the expansion of cities and thus protect nature. Moreover, it is possible to build them even when space is missing. For example, Japan, lacking space, due to the geography of the country and natural disasters that prevents the construction of high buildings, tiny houses would be an ideal solution. The tiny houses can also be designed to be “tiny chalets”. Many people cannot afford to buy a cottage in the countryside after financing their principal residence. This is an ideal solution for a second home in which it would be possible relax by a lake during weekends! Due to their small size, the owners will often have much less repair, maintenance and cleaning to do than in a traditional house. It is also one of the factors that allow these houses to be economic: Quebecers spend on average 27% of their income per year in their home. The owners of tiny houses can then devote their free time to their leisure, families and simply enjoy life! So, convinced? For more information, come visit us at the fair Ecosphère of Montréal from August 11th to 12th.